It's our 100th issue! We are proud to have been serving up the skinny on everything edible for 10 solid years and are still going strong. Our loyal readers, who follow our love of discovering everything and anything about the world of food, are what keep us going and passionate about the work we do (eating all the edible research we can get our hands on, of course). We've interviewed some of the biggest names in the culinary world and had their faces and chef whites gracing our covers over the years, as well as sharing their visionary recipes – from international superstars like Bobby Chin, Joël Robuchon, Jason Atherton, Gordon Ramsay, Jamie Oliver, Nobu Matsuhisa, Alain Ducasse, Heston Blumenthal, Ferran Adrià, Fergus Henderson and Björn Frantzén to famous Hong Kong chefs such as Alvin Leung, Vicky Lau and Richard Ekkebus. We have sunk our teeth into meaty topics and had frequents issues on herbaceous pursuits, food intolerances, clean eating and alternative proteins – all far before they became topics in the mainstream. 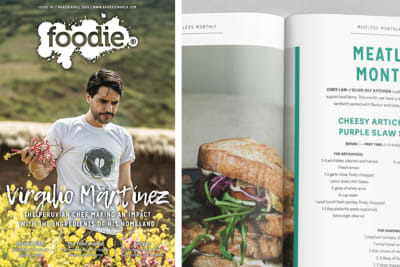 We’ve always aimed to provide our readers with what is at the forefront of the food scene, and we pride ourselves in keeping everyone in the know on what we should all be feeding our bodies and how to nourish our minds. Our popular columns – including My Little Hong Kong Kitchen, Ethical Meats, Meatless Monthly and The Zero Waste Diaries – have kept our readers hungry for more. With their wholesome recipes and tips each issue, they inspire our readers with great ideas for nutritious, environmentally conscious meals and lifestyle adjustments for achieving a delicious, nutritious and mindful food-filled future. Our first-ever issue featured a rather handsome lobster peeking out from a cooking pot, along with some very kitsch fonts and cheesy tag lines that reinforced the urgency for our first redesign a few issues later. 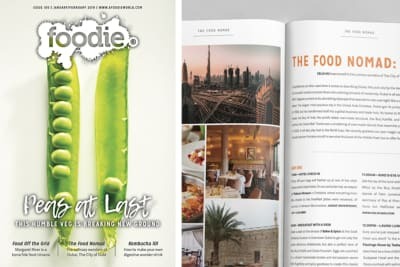 We then knocked out our first awards issue for outstanding restaurants. It’s lovely to look back and see some of the restaurants that have evolved right alongside us; we awarded Posto Pubblico in its opening year, championing their locally grown, socially conscious dining approach, which was considered quite avant-garde at the time. They were light years ahead of the scene and still lead the way as one of this city’s favourite places to dine. More of our favourites today are on this list from 10 years back, like Café Gray Deluxe and WHISK, while a few of the others have shuttered their doors and fallen victim to the cruel hands of Hong Kong’s F&B fate. We had a meat-free Hong Kong issue in 2011 that proved incredibly popular even then and heralded the movement we are seeing within the city today. This issue was all about becoming vegetarian without skimping on any of the nutrients your body needs, as well as providing some tantalising veggie recipes to get you started on a more meat-free existence. That year we also delved into the world of chocolate, which has us now wondering why we haven’t done a specific chocolate issue every year! From dreamy chocolate-based recipes to in-depth, long-read articles, we even had a fun feature where we dipped everything in chocolate to see what worked and what didn’t. This included char siu, green peppers, bao, cheung fan and instant noodles, and there were some big pairing surprises. That was one sweet issue. Then came a literal feast for the eyes, where we interviewed an artist whose medium was food itself. His art made us exceptionally hungry, and his works deserve a second look below. Later that year, we also resurrected classic recipes, giving them a new spin, with old favourites like prawn cocktail revived as an actual drinking cocktail and twisting up Brit fave beef Wellington, making it with lamb instead. We looked into food trends and interviewed both stalwarts of the scene and newbies to the biz, including the owners of Yardbird and Maximal Concepts, both of which are still going strong today, all these years later. We had the enigmatic chef Jason Atherton on the cover after he opened his first restaurant in Hong Kong, 22 Ships, which is still robustly weathering the dining-scene storm in its perfect location in Wanchai. We also had the charming Nobu Matsuhisa as our cover star as we delved into the fifth flavour of umami, which probably seems like something we’ve all known forever, but this was before many had ever even heard the phrase outside Japan. We went deep into clean eating, with gluten-free recipes for those struggling with intolerances and allergies. This was a big year for celebrity chefs, and we had a bunch of them agree to headline our covers, including Alain Ducasse, Heston Blumenthal (following a pop-up collaboration at the Mandarin Oriental), Ferran Adrià, (after launching his latest book), Neil Perry, Gordon Ramsay (upon opening his first HK resto, Bread Street Kitchen, which is set to reopen at The Peak later this year) and the recently dearly departed Joël Robuchon – we will forever be grateful that we were given the chance to pick his exceptionally wise culinary brain. This year saw sustainable seafood, Jamie Oliver and Fergus Henderson adorning our covers, plus one of our favourite chefs in Hong Kong, Vicky Lau of Tate Dining Room & Bar. We delved into Ethiopian eats as recipes on dishes for gourmet game nights by our great chef-friend Que Vinh Dang, who has just opened his latest restaurant, Nhau. The culinary world is very excited to see the return of his creative flavours, which have been noticeably absent since Quest by Que closure’s back in 2016. We basically ate our way around Hong Kong this year, highlighting the best places in each district and producing essential dining guides that are great for visitors who want to do the same. We also went a bit more vegan to cut out and cut down on certain foods in our diet, reducing our meat, fish and dairy intakes, as well as created some amazing guilt-free, no-bake recipes to dip our toes into the raw-food world. We did an issue on fermentation and explained how to get started doing your own pickling and fermenting at home. We still use these recipes for our digestive-aiding now, and so should you. The future of food is going to look very different, and we want to be part of the movement that makes it that way. Our first Food’s Future Summit, which we continue to do annually, was a raging success and showed us the need for more information and conversation around the food of the future. We gathered those pioneering the efforts to make change within the industry in the first large-scale, one-day event designed to bring together change makers, conscious consumers and cutting-edge experts to discover the latest food innovations, upcoming trends and imminent issues in the culinary world and to unite this combined knowledge for a mindful and collective progression toward food’s future. We also asked famous chefs to tell us where they love to eat in Hong Kong. They spilled the beans, and we immediately went and ate wherever they said. And we did a whole issue on coffee, and readers went crazy for it. They’d probably already had a cup or two, right? Last year really saw the plant-based future breathing down our necks as Impossible Foods brought their “plant-based burger that bleeds” to our shores and we saw the launch of JUST’s eggless eggs, made from mung beans of all things (and they really do scramble like the real chicken-born deal). We also had Sweden’s first three-Michelin-starred chef, Björn Frantzén, on our cover and did an entire issue on the explosion of craft beer in the 852. But it wasn’t just about alternative proteins and meat-free dining – after all, we are hearty flexitarians. We bit down hard on the subject of ethical meats and continue to do so within our pages so that we can all be better informed about how to be careful carnivores. This year started with a bang and a pop of pea green, with those mighty little veggie balls making a big impact with those looking for animal-free milk, yoghurt, beef and chicken products. There are recipes of more deliciousness than you’ve ever seen, including one for kombucha that’s good for your gut. We also toured the foodie nirvana of Margaret River and tucked into the eats of the City of Gold, Dubai. If you haven’t read it yet, sink your teeth into this adventurous and enlightening issue that proves that Foodie isn’t slowing down in our old age! Like the taste of what you’ve just seen? There’s plenty more to nourish the soul on our website, where we keep all our back issues. Thanks for sticking with us and making us the fierce and forever-hungry-for-more Foodie we are, have always been and will continue to be. Here’s to 10 years of more good reading (and eating)!